Production systems for growing greens range from high tech hydroponic systems for growing lettuce to growing mixed greens in soilless mix in containers on benches to growing in soil in ground beds using minimal or no heat. The Dept.of Plant Science, Cobleskill, NY is using existing ebb and flow benching for short-term hydroponic raft lettuce production (Country Folks Grower July 2012). One thing common to most (not all) green production systems is the use of a greenhouse structure. Since many greenhouses used to grow spring ornamentals are unused between November and February, greens may be an alternative crop. When growing a crop for the first time, especially if new to vegetable production, begin on a small scale. Growers are advised to research the markets including demands for certain types of greens, harvesting techniques and post harvest handling, storage and packaging. Areas with winter farmers markets have seen a great marketing demand for winter greens, though in some cases the market is getting saturated and competition is high. Resources are available on growing greens in high tunnels that can be adapted to greenhouse production. It may take some experimentation to develop a production system that works for your operation. Note about Organic Production: Before a product can be labeled "organic," a Government-approved certifier inspects the farm where the plants and food are grown to make sure all the rules are being followed that are necessary to meet USDA organic standards. If you are considering growing and selling organic products, contact a certifying agency. See organic resources at end of article. Growers of ornamental crops tend to grow greens in soilless mixes or compost in containers on benches since greenhouses are set up for container ornamental production. In crop production using minimal heat, plants are seeded from early September through the first week of October and harvested in November and December. Early seeding is necessary because crops will accomplish most of their growth before short days and cold temperatures. The growth rate slows during the winter months due to cold temperatures, and low light (cloudy weather and short day length). There is very little or no plant growth when the day length drops below 10 hours per day (end of November - beginning of February in MA). Using minimum heat, winter production of greens relies on plants making their growth throughout the fall. Recent research conducted at University of New Hampshire suggests that some species are more sensitive to temperature than to light whereas others such as lettuce are more sensitive to light than to temperature. One of the keys to success is to plant enough of a crop early in the season for harvesting through the cold season. For example, spinach may take several months to grow in colder months and should be planted in September and October, so it is nearly full-sized in December and can be picked through February. As planting times are perhaps one of the most critical parts of winter harvesting, successful growers develop planting schedules including expected harvest dates and record yields for future use. See resources below for scheduling chart. There are several types of greens that are grown for winter production including, but not limited to: Asian greens such as mizuna and tasoi, kale, lettuce (red and green leaf lettuces, oakleaf, romaine), mustards, gourmet cabbages, Swiss chard, spinach, arugula and claytonia. See research from Univ. 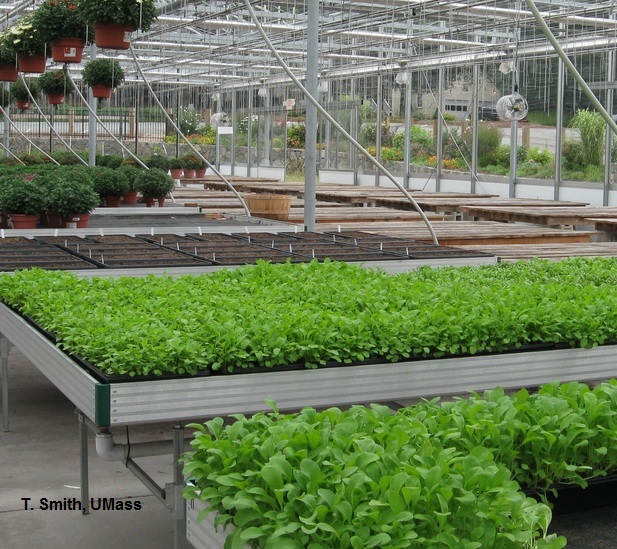 of New Hampshire, "Salad Green Varieties for Benchtop Production". If you are not familiar with some of these greens, eat them yourself first and check out some recipes for greens that are new to you, to help with marketing. Lettuces are not as cold hardy as some other greens and some varieties are better adapted to cold weather and short days, so study seed catalog descriptions. Spinach is very cold hardy. However, during the darkest part of winter, the spinach will grow very, very slow. As days get longer, spinach will regrow rapidly and some varieties will bolt before the end of winter (Feb. or later). Crucifers, including mustards, raab, Oriental greens such as pak choi and tatsoi, are good candidates for cold-weather growing. Swiss chard (Beta vulgaris) grown for its large tender leaves and rapid re-growth is cold hardy and productive. Growers have found it best to plant varieties in different blocks rather than mixed together, since growth rates and times of maturity are different. Also, try several cultivars because some may grow better than others under various light and temperature regimes, and some are quicker to bolt than others. The mixture of greens can be created after harvest. Greens can be direct-seeded in a variety of containers. Open seed flats are popular and fit well on benches. Nursery flats (13" x 17") have been used and last several seasons. Some growers cover the benches with landscape fabric and fill with media to create one large bed. Soilless media or composts are used for planting in containers. Soilless ingredients include peat moss, vermiculite, perlite, shredded coconut husks (coir), or composted materials plus starter nutrients and a wetting agent. Field soils are generally unsatisfactory for the production of plants in containers because soils do not provide the aeration, drainage and water holding capacity that are required. They also need to be pasteurized or fumigated to prevent the development of diseases and germination of weed seeds. Premixed media is common in the greenhouse industry. Suppliers offer a diversity of mixes that are available prepacked (in bags, bales, super sacks) or in bulk. Growing media are designed to achieve high porosity and water retention while providing adequate aeration. Recipes are specially formulated for propagation, specific crops or general use. Soilless media purchased in bags does not have to be pasteurized or fumigated before use. Preventative applications of biological fungicides or fungicides may be necessary with plants prone to damping off. Growers can also obtain commercially available mixes with different types of biological fungicides added to the mix. See: Media Trial for Bench-Top Production of Salad Greens from the Univ. of New Hampshire. Compost-based mixes are also available commercially as a substitute for traditional soilless media, especially for organic production. If growing directly into the ground or in raised beds see New England Vegetable Guide: High Tunnels. The fertility program will depend on the production system. If growing using minimal heat, plants will need less fertilizer as growth slows. Avoid over-fertilizing which leads to soft growth and aphid infestations. For container production, see New England Vegetable Guide: Vegetable Transplants, Growing Media and Nutrition. Automatic sprinklers or hand watering can be used. Irrigate in the morning, to give plant foliage time to dry before temperatures drop at night, especially as days get shorter. As days get shorter and growth slows, less water is used. Avoid overwatering, which makes soft growth. Plants will be less able to withstand cold, and less flavorful. There are many options when it comes to temperature. Temperature will affect the growth rate and also flavor of the greens. For example arugula will become strong flavored when grown at warm temperatures. Some growers produce a succession of greens harvesting every 14-21 days (micro-greens) at 50F nights, 55F days. Other growers provide minimal heat to maintain night temperatures of 37F. On warm or sunny days, greenhouses are ventilated or sides rolled up to let the air in, depending on the structure. Some growers grow in ground beds without supplemental heat. A good book on the subject is "The Winter Harvest Manual" by Eliot Coleman, listed under resources. Some crops such as lettuce and arugula do not grow well without supplemental heat. Growers that are growing in high tunnels without heat tend to use row covers over crops on cold nights. Greens cannot be harvested frozen and must wait until thawed before harvesting. Also, covers must be removed during the day to allow light. Light affects growth and flavor of greens. Decreased daylight will result in slower growth and increasing the temperatures cannot compensate for the reduction in daylight. Also green tend to have milder flavor in lower light. Mesclun grown in lower light is lighter colored than when grown under high light conditions. Growers use a sharp knife, scissors, or hand pick with no tools, one leaf at a time. Some growers prefer a short knife while others prefer a longer one. Greens can be harvested by either removing outer, larger leaves at regular intervals or by cutting the entire plant back to within an inch or so above the soil so the growing point still remains. Leafy crops then re-grow to be harvested again. Once harvested, some growers will move the crop to storage to sale bag. If the crop is dirty, then it will need to be rinsed (double rinsed) and spun (to remove excess moisture). Spinach tends to grow close to the ground and may need washing. Growing in soilless mix or compost in containers on benches eliminates this step for most growers. Two popular markets for greens are winter farmers markets and restaurants. Many community supported agriculture (CSA) farms are offering winter shares and some may be interested in buying in greens to add to the winter and storage crops they offer. Some of the pests encountered when growing greens include, aphids and thrips. Diseases include Downy mildew on lettuce and spinach (two different species). Some newer varieties of spinach are promoted to have resistance to many races of Downy Mildew, however it may not be resistant to all races. Powdery Mildew is a problem on lettuce under conditions of low light and high humidity. Voles can be also be a problem when growing greens.